Provide comfort for the family of Linda D. Rodriguez with a meaningful gesture of sympathy. Wake service will be 6:30 pm Wednesday, January 30th in the South Colonial Chapel. 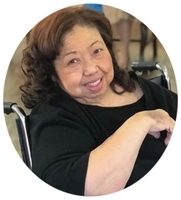 Mass service will be 10:30 am Thursday, January 31st at St James Church, 4201 S McKinney Ave.
Linda D. Rodriguez was born April 3, 1947 and passed on January 27, 2019. She was survived by 3 amazing but very difficult daughters; Sherri Hunt of Maui, Hawaii, Stacey Leonard of Oklahoma City, and Amber Rodriguez of New York City. Linda was the proud & sometime tortured Lola of Nicole, Allie, April, Austin, & Alohalani. She was the Lola and great-grandmother of 6 with one more on the way. None of her family went hungry in her presence. Ms. Rodriguez devoted her time to philanthropic work at St. James Catholic Church for 13 years. She also worked in fundraising for Oklahoma City Community Foundation. Prior to her work as a development director, she worked at Walker Law Firm where she met lifelong friends. In later life she continued to volunteer for the church and at a food pantry. Linda spent her free time crafting, gardening, cooking, cake decorating, and hosting events. She was an overachiever when it came to her hobbies and a force to be reckoned with. She was ready to greet you with a smile and a joke (often at her own expense). Her talent, humor and grace will be missed by all. Ms. Rodriguez’ greatest pleasures in life were her family and friends. If she was your friend, you would be a friend for life and there is nothing she wouldn’t do for you. If you weren’t then watch out! A consummate gift giver, Linda would go out of her way to bake your favorite dish, decorate a cake, or find an off-color gift to make you laugh. She was a tried and true friend and touched many people’s lives. In life Linda Rodriguez was someone you never met the likes of and in death she is someone who will never be forgotten. Her family thanks you for being here to celebrate her life. To send flowers in memory of Linda D. Rodriguez, please visit our Heartfelt Sympathies Store. We encourage you to share your most beloved memories of Linda D. Rodriguez here, so that the family and other loved ones can always see it. You can upload cherished photographs, or share your favorite stories, and can even comment on those shared by others. Provide comfort for the family of Linda D. Rodriguez by sending flowers. My condolences to the Rodriguez family during this difficult time. In the Bible, Jehovah God gives us hope. Acts 24:15 says, “there is going to be a resurrection of both the righteous and the unrighteous.” Revelation 21:4 says, “and he will wipe out every tear from their eyes and death will be no more.” Very soon we will see the fulfillment of these promises here on Earth. We hope you find comfort in God’s promises.